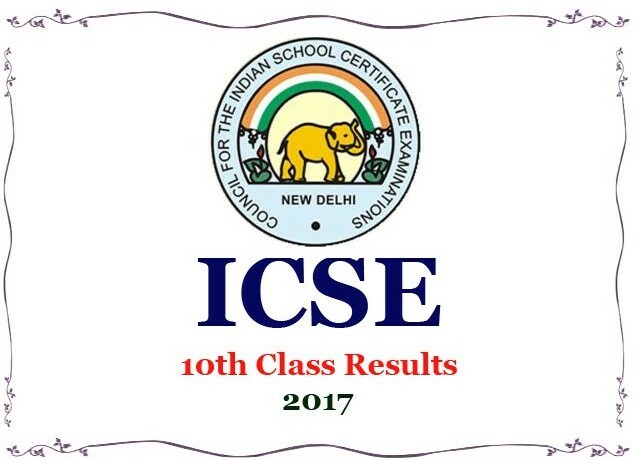 ICSE 10th Result 2017: The Council for the Indian School Certificate Examinations (CISCE) made an official update on ICSE class 10th exam results. CISCE ICSE Class X exam result will be declared on mid-may. The results will be published on the official CISCE website, cisce.org. The students can check their result by entering their registration number in their hall ticket to check their result. Update on ICSE, ISC exam results: Since many websites started publishing fake news that results are to be declared and some websites published news as ICSE results declared, a lot of students and parents were restlessly checked www.cisce.org results page and due to heavy traffic, their website server went down today morning. After this incident, CISCE made an official announcement that result will not be declared today. After this incident, CISCE made an official announcement that result will not be declared today. Gerry Arathoon also stated that result date will be intimated 48 hours in prior on the official website and asked not to trust other resources. We got an update that result date will be declared today. The ICSE 10th result 2017 will be declared on 21st May 2017. ICSE result was about to be declared many days prior but got delayed due to the assembly election in the 5 states. 2016 ISC class 12 results were declared last year on 6th May. This year, it will be released in the 3rd week of May. Over 2 lakh+ students registered for ICSE exams this year and 75,000students were registered for ISC Exams. They all are eagerly waiting for their exam results. ICSE 10th result will be declared today afternoon. According to the report from the trusted source, ISC result 2017 will be declared in a few days after the ICSE result. Check out TN 12th Revaluation Procedure. Visit www.cisce.org – ICSE Result official website. Click on the ICSE 10th Result. Enter your registration number and other details. Click on the submit button, the result will be displayed in a second. About the ICSE Board: The Council has been so constituted as to secure suitable representation of the Government of India, State Governments/Union Territories in which there are Schools affiliated to the Council, the Inter-State Board for Anglo-Indian Education, the Association of Indian Universities, the Association of Heads of Anglo-Indian Schools, the Indian Public Schools’ Conference, the Association of Schools for the ISC Examination and members co-opted by the Executive Committee of the Council. Stay tuned for more updates on ICSE 10th result toppers list, paper revaluation procedure, fees and last date details. SO WILL THE RESULTS BE DECLARED ON 20TH ?? Any idea when are the results? Update to all the students who are checking their ICSE 10th result – Result will not be declared today, an official update from CISCE. Be relax and don’t believe any rumors. but when will be the results..??? They stated that result date will be announced one week prior in the cisce website. So it should be only after next Monday I think. We will update this page once we got info from our trusted source. This is media hype…..Well ICSE has not made any official update, this update is highly misguiding. These people are just Spreading Hoax. The site crashed today morning due to heavy traffic. Is this icse result thing true?? It’s depend on u and ur interest .